FACEIT revealed the matches Wednesday for the second day of competition in the FACEIT Major Legends stage. ​After eight of the 16 total teams won their first ​Counter-Strike: Global Offensive matches of the tournament, those teams will face each other the next day in the high group. BIG will play TyLoo, compLexity Gaming will play G2 Esports, Vega Squadron will play Astralis, and Team Liquid will play Ninjas in Pyjamas. The remaining teams, at 0-1, will fight among themselves in the low group. The matches will be Natus Vincere vs. FaZe Clan, mousesports vs. MIBR, Cloud9 vs. HellRaisers, and Winstrike vs. Fnatic. The matchups were determined by random draw, with group members sorted based on whether they won or lost their first match of the day. Several upsets marked competition on day one, including FaZe crumbling against BIG and compLexity stunning Fnatic. 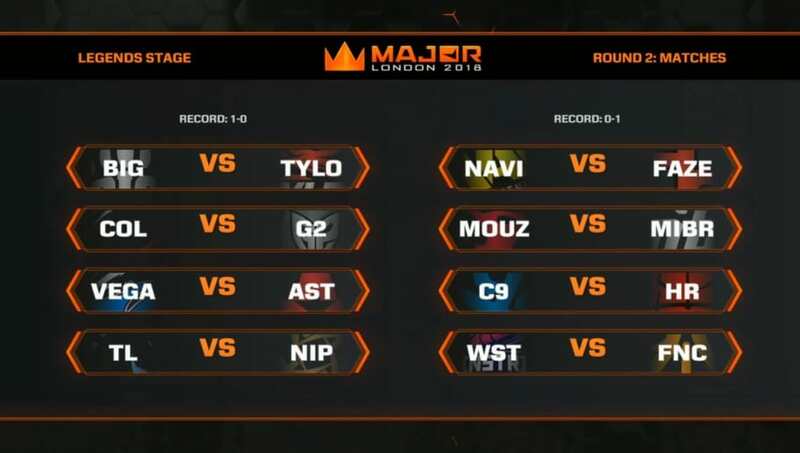 Play at the FACEIT London Major Legends stage will continue through Sept. 16.